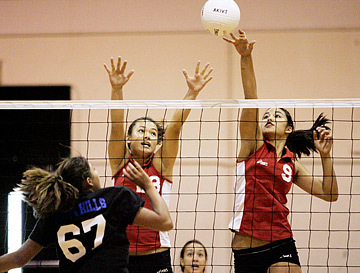 Iolani's Miyoko Pettit, left, and Chelsea Hardin went up to block a shot by Dana Hills' Felicia Arriola yesterday at Iolani. There are less stressful ways to start off a nonconference schedule. For Iolani, there's no substitute for the Ann Kang Invitational Tournament, the event named after their longtime girls volleyball coach. The tourney has developed into the premier preseason tourney in the state. The Raiders opened pool play by splitting with Dana Hills (Calif.) in Pool B yesterday morning at Iolani. Under new coach Jenic Tumaneng, Iolani is expected to challenge for the Interscholastic League of Honolulu championship. For now, foes like Dana Hills are providing valuable competition. "At least we know what to work on. In terms of our players, I wanted to see where they can fit," said Tumaneng, who coached at Farrington before coming to Iolani. "One plus was we can hit balls, not siding out." Iolani won the first game 23-21 before falling to the Dolphins 25-18. "We've gotta get something going on those free balls," Tumaneng added. Outside hitter Lauren Minkel, now a junior, is willing to be patient. "Our team isn't quite jelled yet. We gotta work on our chemistry. Once we get to play together, we'll be OK," she said, referring to a mix of new players. Several key players graduated, but setter Kapua Kamana'o is back, as is defensive whiz Kelly Pang. "We'll be all right. There were some first-game jitters," Minkel added. Iolani, which is relatively young, got five kills from Minkel. Four of them came in the first game. Sophomore middle hitter Chelsea Hardin tallied eight kills and one service ace, but showed her youth. She had a bundle of hitting errors, maybe the result of some nerves. "(Dana Hills) is very good at defense. They were digging us," Minkel added. Dolphins outside hitter Felicia Arriola was quiet in the opening set with only one kill. The 5-foot-9 sophomore came to life after that with four kills to spark her team. "It was an OK start for us," Dana Hills coach Lael Fresenius said. "I have no idea what to expect. That's the first time I've seen my team play against another team. We're young and we were a little nervous in the first game." Moanalua got plenty of tough competition at the Kauai Challenge, which concluded on Saturday. Today, coach Tommy Lake's team is in the same pool with national powerhouse Mira Costa (Calif.). "I hope it doesn't come down to us having to play well against Mira Costa, but it's fun playing against one of the top teams in the country," he said. The Menehunes are somewhat young on paper, but have as much firepower as any team in the Oahu Interscholastic Association. Brianna Amian, a senior outside hitter, has bumped up her game. "Bri had a really good Kauai Challenge. She was hitting close to .400, passing really well, just played a solid game," Lake said. "Senior year, she's ready to play." Kaleinani Kabalis came on in a powerful way last season, her first as a Menehune. At just 5-6, the former Hilo standout anchors the Moanalua attack with a lethal swing and tremendous hops. Finding a consistent setter is a key for the Menehunes. Freshman Carsen Mata, a transfer from New Jersey, is an outside hitter who will learn the role at setter, Lake said. Sophomore Kaylee Ponce is also stepping into a roster that features 10 returnees. "We're probably where we were at midseason last year," Lake said. "The Kauai Challenge really helped us. The first day, we lost to Waimea, just looked terrible. But we got better and better." Lake also has an observation about the rapidly rising level of play in the Kauai Interscholastic Federation. "Kapaa is supposed to be the favorite, but Waimea has the hardest hitter. It's hard to say who the best team is," he said. Last season, the Griffins of Los Alamitos (Calif.) became the first school not named Mira Costa to win the Ann Kang title in the last four years. Not only did coach Jimmy Munoz's team win the crown, the Griffins went on to an unbeaten season as California Interscholastic Federation champions (33-3 overall) in their division. They returned to Honolulu and began play in this year's Ann Kang tourney yesterday, stronger, quicker and wiser. Talk of a matchup with Mira Costa in the finals is premature, of course. "They talk a little about it. In the back of their minds, they know it could happen," Munoz said of his team. If it doesn't, Los Al still has a scheduled match against Mira Costa (35-2, CIF and state champion last year). Los Al, which sent five players to the college ranks last year, returns five starters. Geena Urango, a 5-10 outside hitter, has committed to USC, while setter Katie Crosby has given Cal her commitment. Mira Costa, which begins pool play today, boasts 6-4 Alix Klineman. The athletic outside hitter hasn't committed to a college yet, but she is highly coveted by the nation's best, including Hawaii. If Mira Costa and Los Al match up here, it could be a pairing of Top-5 teams in the nation. "They all know each other from club play," Munoz said, referring to TCA and Mizuno Long Beach. The Griffins, Munoz promised, will not overlook any foe. "It's the same as last year. They know they have a job to do every match, and do well. They also like to have fun," he said. The players hit the beach on Tuesday, while the coaches hit the links. Tonight, the Griffins will enjoy a luau, but that's about it as far as activities. The rest of their fun will derive from the tournament, easily the most prestigious in the islands. "I love it," Munoz said. "It's Hawaii." Kamehameha's Alexis Robbins, one of the most versatile weapons on last year's girls volleyball state championship team, is out for the season due to an ACL injury suffered this summer. Robbins, a senior, tore an ACL while playing for Maunalani Volleyball Club at the Junior Olympics. She had surgery in early August and is now in rehabilitation. "It was a great loss. She was gonna be a four-year starter," Kamehameha coach Chris Blake said. "On a good note, she committed to a good college already." Robbins is committed to the University of Portland. "Hopefully, she'll be up and running for club season, depending on how everything goes. She's doing a lot of the rehab up at the school, so she's definitely part of the team," Blake said. "For every door that closes, another opens, and we get another opportunity to see other people," he added. Kamehameha scrimmaged Mira Costa (Calif.) on Tuesday. Kamehameha isn't in the Kang tourney, but will host the Hawaii Invitational, which runs Monday through Wednesday at Kekuhaupio Gym. Punahou, Roosevelt, Moanalua, Kalani, Maryknoll, Mid-Pacific, Kahuku and Kamehameha are competing for the tournament title. Kamehameha begins regular-season play against Hanalani on Aug. 31.